tops and yoyos is worth more than wildlife. I just finished Moby Duck: The True Story of 28,800 Bath Toys Lost at Sea and of the Beachcombers, Oceanographers, Environmentalists, and Fools, Including the Author,Who Went in Search of Them, which is a quest to find plastic ducks that spilled off a container ship. Part of what I liked about it is how it follows tangents and chance discoveries, such as when the author explores how the rubber duck became such an icon of childhood, and even describes how childhood itself has changed. I like a rambling, inquisitive book. 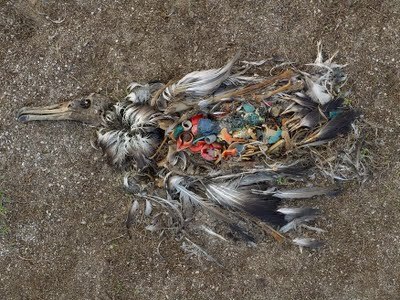 But, while I knew of the Great Pacific Garbage Patch, it really brought the issue to the forefront of my consciousness. As a mother concerned with the amount of sugar American kids are consuming these days, I thought, along with other like-minded mothers, let's put trinkets instead of candy in the goodie bags (God forbid I let my daughter's birthday pass without goodie bags. She'd be shunned). Now I have to come up with Plan C, since these trinkets are killing the endangered albatross chicks. the trash that the combers clean out end up? Everything today comes in plastic. It wasn't that long ago that plastics weren't ubiquitous, yet kids today would be hard pressed to understand how people consumed food that didn't come wrapped in plastic. Think about it. 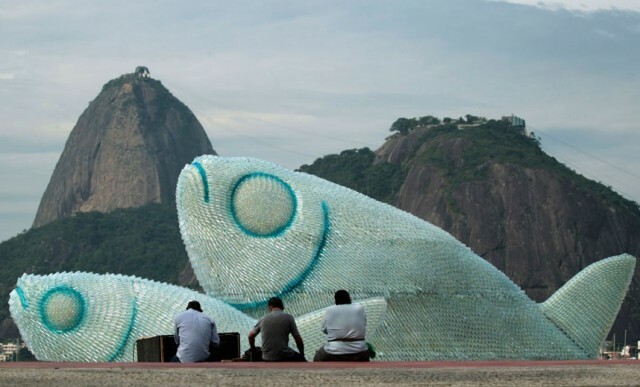 What food does not have to be wrapped, carried or contained in plastic? We used to wrap things in foil, wax or paper, remember? Beverages came in tin cans or in glass bottles. That Subway sandwich that you took home in the plastic bag that got thrown out after 5 minutes of use will remain floating in the ocean for, oh, around 500 years. 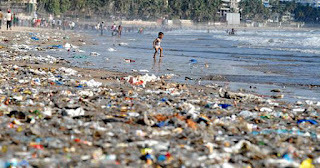 And, those long plastic polymer chains will be digested by sea life, causing who-knows-what type of damage. Hopefully this will make people think things through differently, but I don't think anyone really cares. We'd much rather have our daily conveniences and consequences be damned. 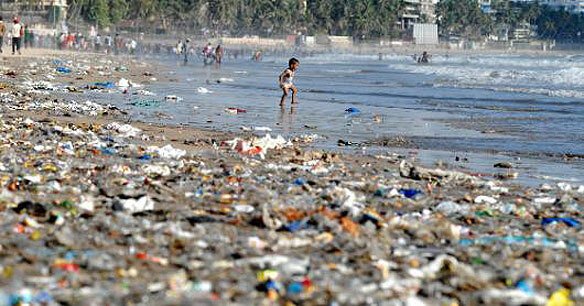 Perhaps when every beach looks like the one pictured below, we'll take notice of the problem. Now, I don't want to let my readers off the hook; it's another doom-and-gloom scenario that we feel powerless to control. But, some people turn this negative into positives. Okay, perhaps I have a bizarre chandelier fetish, but there is an artist who makes found plastic objects into the most spectacular lighting. 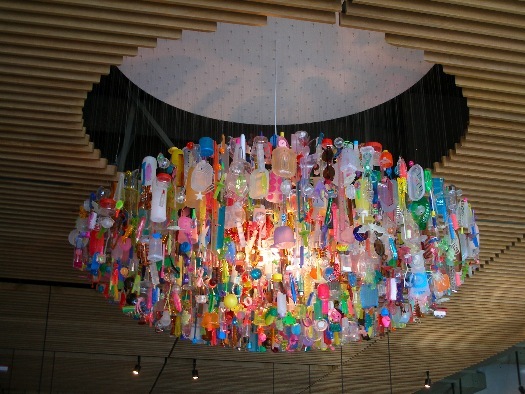 The whole planet cannot be turned into a chandelier, but maybe someone will find another, more practical use for this new, growing, unsightly problem.